You heard it here first - Odd Molly will be hitting the New York runways for Mercedes-Benz Fashion Week in September! This season, one of the most prestigious and sought-after fashion events in the world takes centre stage in its new home at Lincoln Centre where 90+ of the globe's top profile premium brands will show-off their upcoming collections to a discerning crowd of stylists, celebs, fashionistas, editors and buyers. Showing in New York will mark our second time hitting the runways in North America - first, we made a splash @ the Mondrian hotel's famous Sky Bar in Los Angeles (I mean this quite literally as anyone who was there will remember one of the front row attendees taking a surprise dip in the pool immediately post-show ;). The LA event was hosted by the gorgeous Darryl Hannah and helped launch the brand to super-new-heights from Brooklyn to San Fransisco. 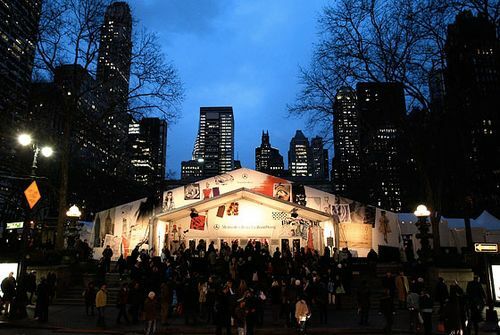 Alongside Odd Molly, New York Fashion Week will include shows from the likes of Malandrino, Ralph Lauren, IVANAhelsinki, Tibi NYC, Betsey Johnson & the incomparable Diane Von Furstenberg. Read all about it here and stay tuned for LOTS more updates over the coming weeks. So many tasks on the list, but with a great team we know it will be an incredible show and I am hoping we can work to stream it live for you all to join in around the world!